Small waterbodies – why care? There are 547 million very small waterbodies that exist globally. These small water bodies make up only 8.6% of global lake surface area, but contribute a staggering 40% of lake freshwater methane emissions. This is a big deal, because methane emissions are an even greater contributor to climate change than carbon dioxide emissions. With the expansion of agriculture and urban land use, a new type of unaccounted for waterbody has evolved – small artificial waterbodies. Artificial aquatic systems have been created through human hydrological “replumbing” of the landscape, and include small farm dams and urban ponds. This has opened up new and unexplored territory for researchers to further understand the contribution of small waterbodies to global freshwater carbon emissions. Although the actual number and distribution of small artificial waterbodies remains to be measured, there are likely upwards of 16 million small dams that exist globally. Being so small and abundant, this is comparable to natural ponds which are estimated to make up 300 million globally. Between not knowing the exact number of small waterbodies and a poor understanding of how much methane is really emitted from these water bodies it is difficult for researchers to estimate the contribution of small artificial waterbodies to landscape greenhouse gas (GHG) emissions. 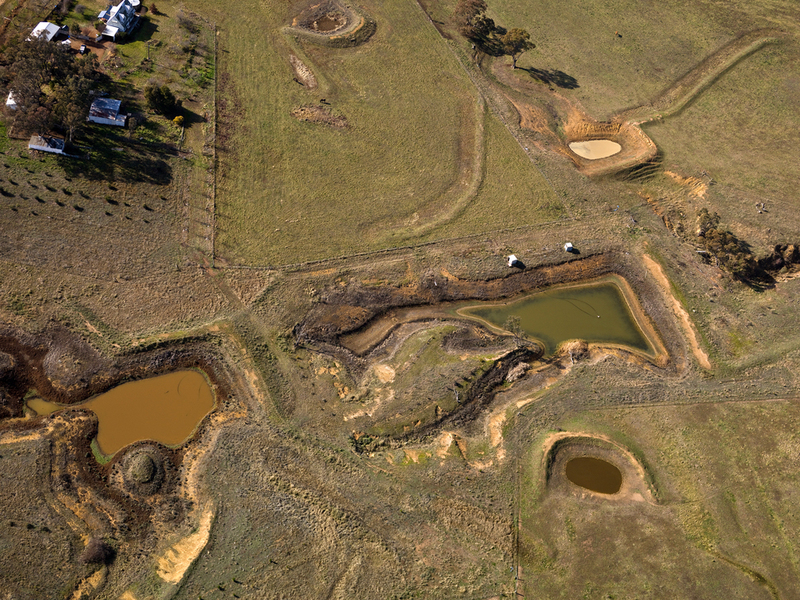 In an effort to build a dataset and refine estimates of regional land use methane emissions, researchers from Australia assessed the extent of methane emissions from a range of different small artificial waterbodies across the agriculturally dominant state of Queensland, Australia. They demonstrate just how abundant these systems are and that their large contribution as methane sources shouldn’t be ignored. To achieve the goal of refining regional land use methane emissions to include small artificial waterbodies, the authors investigated three key components: 1) Quantify the number and surface area of unaccounted for small artificial waterbodies; 2) determine methane emission rates from different waterbody types; and 3) assess the spatial and seasonal variability in methane emissions. The relative surface area of the waterbodies across the region was quantified using high resolution aerial imagery and pre-existing spatial databases. The authors identified all waterbodies within the study area that were less than 10,000 m2 in surface area and separate them into two different size classes. These could be broadly identified as small stock dams (<3500 m2) and irrigation dams and urban ponds (<10,000 m2). Methane emissions were then assessed from different waterbody types, including farm dams, urban lakes, small weir systems, and rural residential water supplies. Ebullition (bubble flux) is the dominant methane emission pathway in small artificial waterbodies. Source: NASA, 2016. The small artificial waterbodies were found to be highly abundant, representing a third of the total surface water area in the region. Because they made an effort to include even the smallest waterbodies, the authors were able to calculate that small waterbodies account for 10% of the entire region’s land use methane emissions! The majority of waterbodies were found in grazing lands, with the density of farm dams up to 20 per km2 in some areas. However, across the various land use areas the research team found that waterbodies emitted similar amounts of methane. Methane released from weir waterbodies was four times higher than the other classes. Weir sites are some of the smallest waterbodies, and the authors found that size does make a difference in the amount of methane emissions released in these artificial waterbodies. In general though, it was the shallower water levels and higher sedimentation rates (which increases bubble flux) that contributed to the highest methane emissions. This study highlights the potential global importance of including small artificial waterbodies in land use GHG inventories. Being one of the first regional scale studies of methane emissions from small artificial waterbodies, this study will likely stimulate a new direction of research that aims to further control GHG fluxes and spatial abundance of these systems. The authors highlight areas of research priority that will help reduce uncertainty in future upscaling attempts. This work provided insight into one of the three major GHGs that contribute to climate change, yet the contribution of the other GHGs, carbon dioxide and nitrous oxide, require comprehensive assessment also. With the abundance of farm dams already recognised across five major continents and the continued proliferation of small water bodies at rates as high as 60% per year, it’s time start paying attention to the GHG impact of small artificial waterbodies. ← Pollution to Solution: Can We Get Rid of Plastics in Our Oceans?